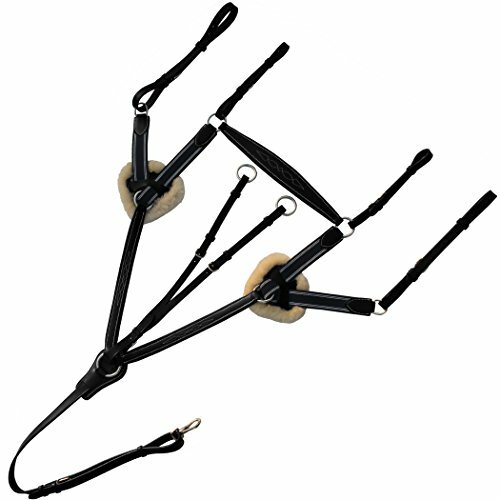 These Flat Laced Reins will be the ideal addition to your tack collection due to the easy grip guaranteed. Our Henri de Rivel Advantage Flat Laced Reins are offered in a couple of color options to match your HDR bridles. 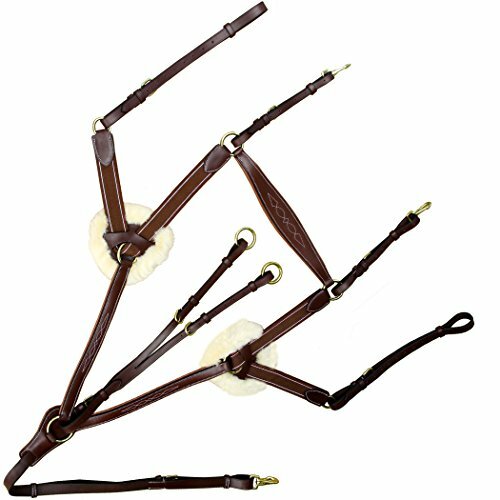 These flat laced reins will help you maintain a great grip on the reins for control. Part of the Henri de Rivel label, the HDR Advantage Flat Laced Reins offer you superior leather goods and superior performance at a superior price. HDR riding saddles and leather goods are expertly designed with unmatched craftsmanship and attention to detail. 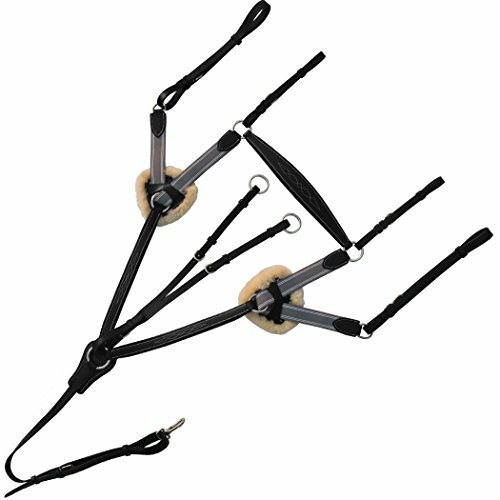 These Flat Laced Reins will be the ideal addition to your tack collection due to the easy grip guaranteed. 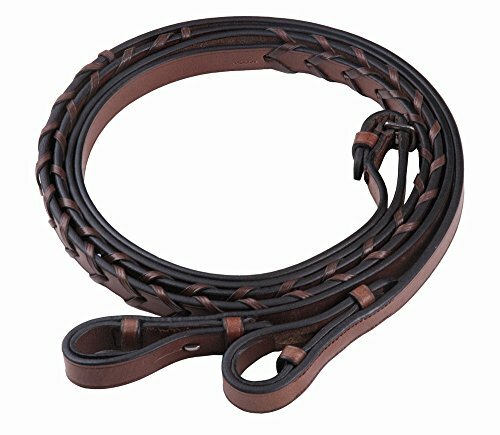 If you're looking for a reliable martingale for your jumping horse, you can't go wrong with this one. It comes with a running attachment and has fleece padding at the shoulders so your horse can be contented. Rough out oiled canyon rose harness leather gives this contoured breast collar the perfect touch of western style. 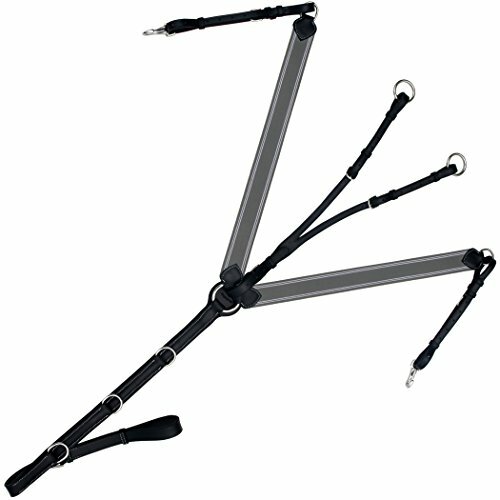 Features a center ring with leather backer, a tie down dee and an adjustable center strap with snap. Width tapers from 1-3/4" to 1-1/4". Non-rust stainless steel hardware. Horse size. Cashel Fleece Breastcollar This soft and comfortable Fleece Breastcollar is designed to be used with any western style saddle. The removable and washable fleece back is soft and comfortable to your horse. 3/4 inch adjustable nylon strap closures. 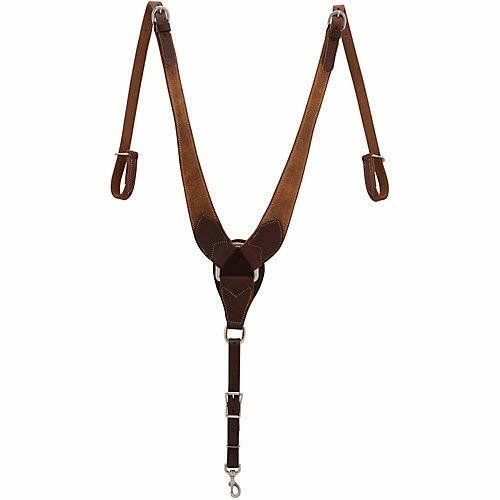 Designed to be used with any western style saddle. 3/4 inch adjustable nylon strap closures. 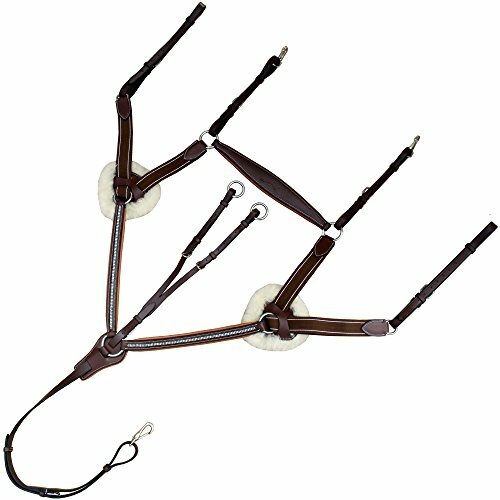 Zilco S Hackamore Features: Comfortable, customizable fit. 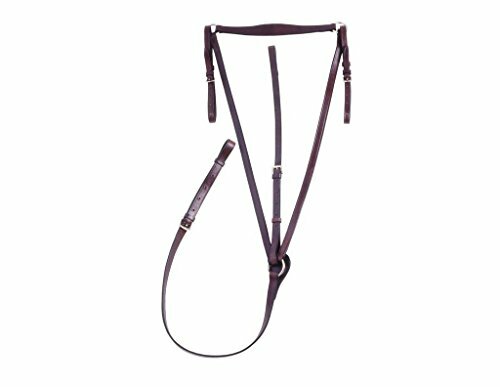 Zilco's patented synthetic material will not stretch, crack, fade or discolor Dual chin and noseband adjustments, allowing for a more precise fit Contoured, PVC waffle-padded noseband Angled stainless steel shanks, and bridle attachment rings deliver the lateral control needed for high level riders. 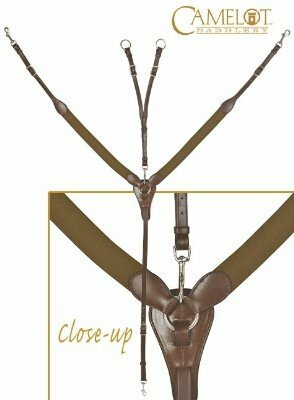 Specifications: Measurements (approximate): Noseband 9 - 12" Chin Strap: 5 - 11" Shank: 7"
Increasingly popular among both competitive and leisure riders, Zilco Bitless Attachments offer a variety of styles to suit most preferences. 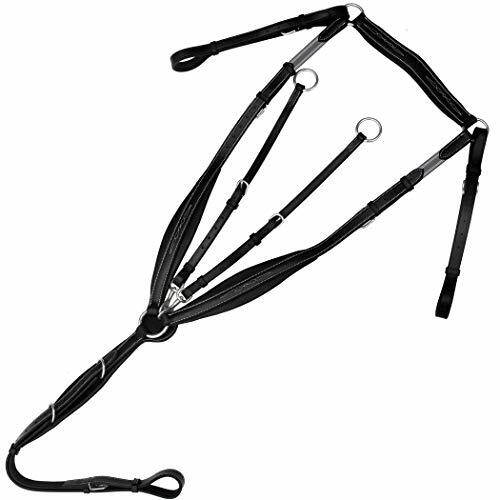 All Zilco nosebands are constructed from the same high quality materials - padded and will not stretch, change color, crack or fade. 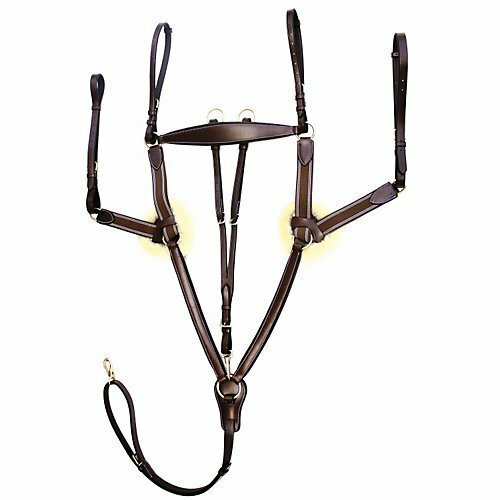 Will work with most bridles. Less poll action but more nose and jaw pressure. The swept back shank design allows easier grazing and drinking. 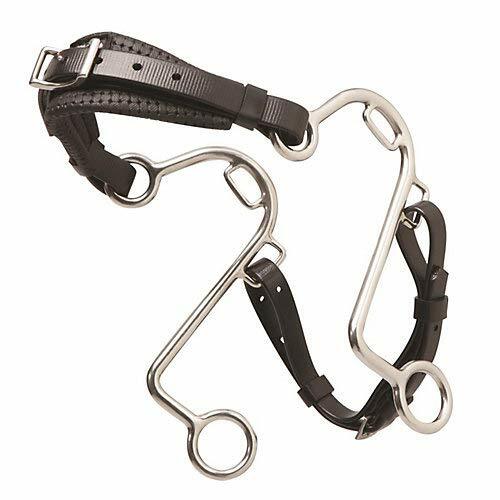 The Camelot Elastic Breastcollar keeps the saddle in place without effecting the horses movement. This breastplate also comes with a matching running attachment with a snap for easy removal. Made of the famous Camelot quality leather. 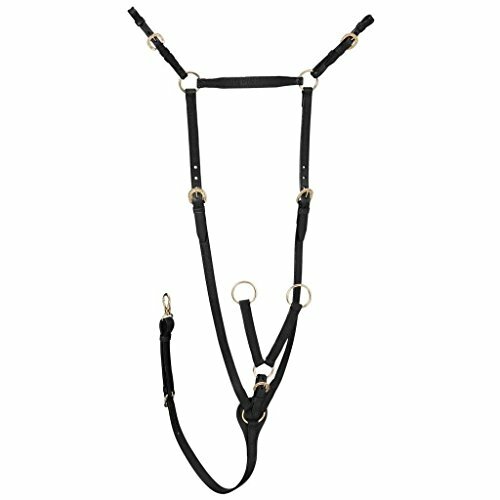 The Camelot Elastic Breastcollar comes in a variety of leather with silver plated hardware to match your saddle. A breast plate is one of the most important riding tack used in horses. It keeps the girth in sound position. Exion brings you most trendy and fashionable breast plate. Thoughtfully conceptualized breast plate of Grey Elastic with White Strips, leather amalgamated inserts at chest. The elasticity of the chest plate ensures the ultra-comfortable fitting in squeezing as well as swelling states. Exion brings you most trendy and fashionable breast plate. Thoughtfully conceptualized breast plate of Grey Elastic with White Strips, leather amalgamated inserts at chest. The elasticity of the chest plate ensures the ultra-comfortable fitting in squeezing as well as swelling states. Exion brings you most trendy, fashionable and very technically crafted Special design Breast plate to hold horse from five points to increase the comfort and control of Ride and Mount. The overarching objective of a breast plate is to keep the saddle centred. All types of breast plates attempt to do this function. A five point breast plate will help user in keeping the girth more forward, preventing it from probability of slipping back. The 5 point design will naturally distribute the pressure over a larger area than a breast plate with just a couple of points of contact. It could also be said that 5 point breast plates don't put as much pressure on the tree of the saddle when the rider jump. Use of original Sheep skin & elastic leather amalgamated inserts at chest. The elasticity of the chest plate ensures the ultra-comfortable fitting in squeezing as well as swelling states and makes this breast plate elegant choice for the riders how love style with better control and comfort. Multi Punches adjustment points ensure a perfect fit. Soft padded head peice with Running Attachment makes it durable for show jumping. The overarching objective of a breast plate is to keep the saddle centred. All types of breast plates attempt to do this function. A five point breast plate will help user in keeping the girth more forward, preventing it from probability of slipping back. The 5 point design will naturally distribute the pressure over a larger area than a breast plate with just a couple of points of contact. It could also be said that 5 point breast plates don't put as much pressure on the tree of the saddle when the rider jump. Use of original Sheep skin & elastic leather amalgamated inserts at chest. The elasticity of the chest plate ensures the ultra-comfortable fitting in squeezing as well as swelling states and makes this breast plate elegant choice for the riders how love style with better control and comfort. Multi Punches adjustment points ensure a perfect fit. Soft padded Monochrome style with Running Attachment makes it durable for show jumping. Each stitch is precisely sewn and counts up to 10 to 12 stitches per inch with heavy duty cotton threads which are trimmed to impart clean and finished looks in order to retain optimum durability and beauty. Smoothly finished and curved with special polish & lacquered on premium quality of brass buckles for long lasting results. A SUPERFINE and ULTIMATE COMFORTABLE piece of tack from the house of Exion. Hand crafted with distinct quality Exion leather, this tack is certainly a marvellous piece of art. Special limited petal like design on shoulder straps as well as bottom straps make the look out of the world. Wither straps also marks the wave like feature for the optimum adjustment of animal's ears. This line breaking and contrast designing makes the product adorable and desirable. Meticulous and seamless stitching keeps the art in the frontier row. This can be called as Beauty with Strength. Hand crafted with distinct quality Exion leather, this tack is certainly a marvellous piece of art. Special limited petal like design on shoulder straps as well as bottom straps make the look out of the world. Wither straps also marks the wave like feature for the optimum adjustment of animal's ears. This line breaking and contrast designing makes the product adorable and desirable. Conceptualized breast plate of Elastic with, leather amalgamated inserts at chest. The elasticity of the chest plate ensures the ultra-comfortable fitting in squeezing as well as swelling states & comfortable buckle guard on insertion point enhances the comfort zone of the animal which helps him to perform better. 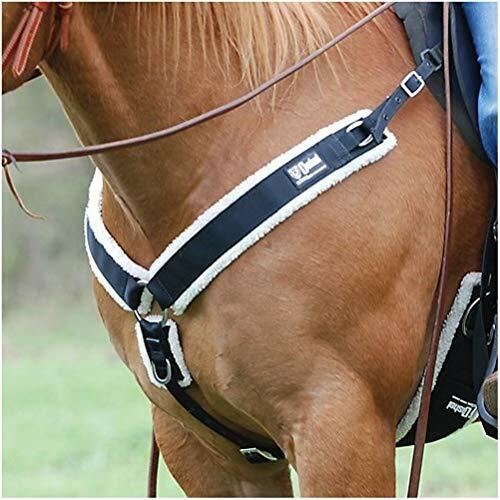 Soft padding on wither straps and Bottom strap eradicates the tension and avoids any kind of chafing on the shoulders, making it smooth for the animal and imparts better control and best experience to the rider. Bottom Straps which articulate the said specimen to the girth, are fabricated with body long inbuilt padding so that comfort factor could be upgraded to the ultimate limit.Meticulous and seamless stitching keeps the art in the frontier row. 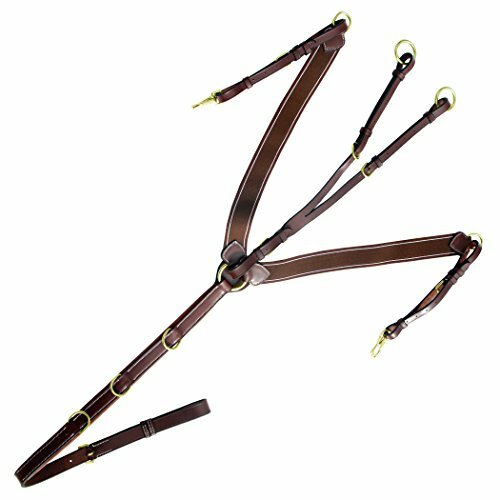 Keeping in view the significance and uses of wither straps, it features in the product to inhibit the horse stride. The Standing attachment on breast collar is adjustable with a number of holes on it and on chest strap. Snaps are provided on both end to attach with saddle. This is a very rich quality product crafted with elite quality Vegetable tanned drum dyed leather, which is the best and foremost used in the Asian Continent and delivers the smooth finish along with attractive looks for schooling purposes and show ring. Special polish on premium quality of stainless steel buckles for long lasting results. 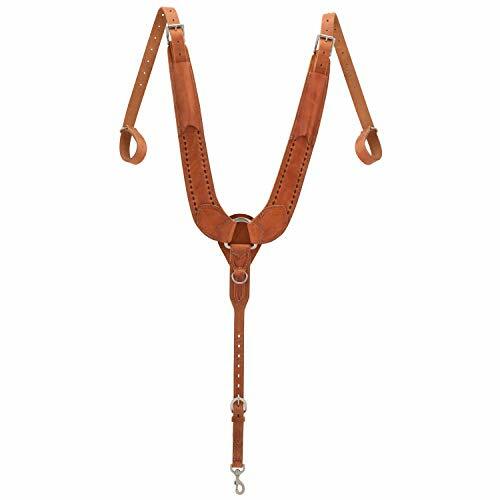 Patterned after harness pulling collars, this design features two straps that attach to the swell of the saddle and roller buckles for easy buckling. Constructed from rugged Hermann Oak russet harness leather, this breast collar is highlighted with chocolate leather lace backstitching for the perfect touch of added style. Non-rust stainless steel hardware. Horse size. A breast plate is one of the most important riding tack used in horses. It keeps the girth in sound position. Exion brings you most trendy and fashionable breast plate. Thoughtfully conceptualized breast plate of Brown Elastic having Grey & Maroon lines leather amalgamated inserts at chest. The elasticity of the chest plate ensures the ultra-comfortable fitting in squeezing as well as swelling states. Exion brings you most trendy and fashionable breast plate. Thoughtfully conceptualized breast plate of Brown Elastic having Grey & Maroon lines leather amalgamated inserts at chest. The elasticity of the chest plate ensures the ultra-comfortable fitting in squeezing as well as swelling states. Each stitch is precisely sewn and counts up to 10 to 12 stitches per inch with heavy duty cotton threads which are trimmed to impart clean and finished looks in order to retain optimum durability and beauty. Smoothly finished and curved with special polish & lacquered on premium quality of Stainless Steel buckles for long lasting results. The tiny diamond particles create a heavenly over look of the riding animal and attracts the attention of every stage sharer. It is best used for show purpose where it can leave an unforgettable impression and memories.The overarching objective of a breast plate is to keep the saddle centred. All types of breast plates attempt to do this function. A five point breast plate will help user in keeping the girth more forward, preventing it from probability of slipping back. The 5 point design will naturally distribute the pressure over a larger area than a breast plate with just a couple of points of contact. It could also be said that 5 point breast plates don't put as much pressure on the tree of the saddle when the rider jump. In this member of the breast plate family, the tiny diamond particles are stitched instead of regular fancy stitching. The tiny diamond particles create a heavenly over look of the riding animal and attracts the attention of every stage sharer. It is best used for show purpose where it can leave an unforgettable impression and memories.The overarching objective of a breast plate is to keep the saddle centred. All types of breast plates attempt to do this function. This is a very rich quality product crafted with elite quality Vegetable tanned drum dyed leather, which is the best and foremost used in the Asian Continent and delivers the smooth finish along with attractive looks for schooling purposes and show ring.Each stitch is precisely sewn and counts up to 10 to 12 stitches per inch with heavy duty cotton threads which are trimmed to impart clean and finished looks in order to retain optimum durability and beauty. Each stitch is precisely sewn and counts up to 10 to 12 stitches per inch with heavy duty cotton threads which are trimmed to impart clean and finished looks in order to retain optimum durability and beauty. Smoothly finished and curved with special polish & lacquered on premium quality of Stainless buckles for long lasting results.